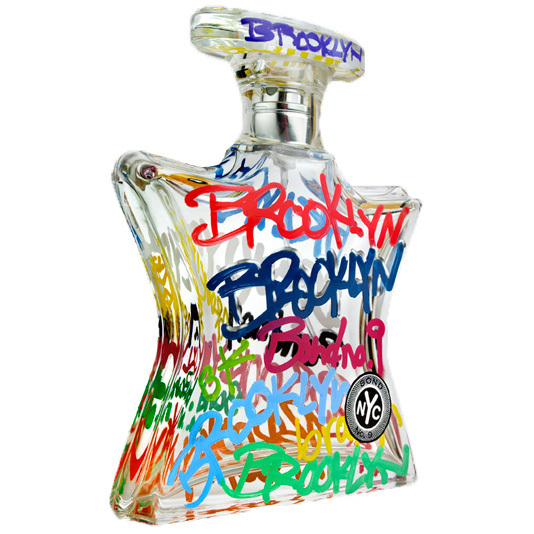 The Brooklyn bottle's design marks a first for the iconic Bond No. 9 superstar flacon: decorated directly onto the transparent glass surface with edgy, urban, handwritten script. With the words BROOKLYN and BOND NO. 9 spelled out in a vivid array of colors, this is an example of contemporary street art with a message. In fact, the dynamic lettering transcends the Bond No. 9 centrepiece token logo it's meant to be enclosed in-and almost seems to take off beyond the curved and angled shape of the bottle itself.